Sling-Sat is a space sweeper idea designed to remove orbital debris from Earth orbit. A proposed space-junk removal system would hop from one piece of debris to the next without burning much fuel, potentially making a de-clutter mission economically feasible with current technologiy. The TAMU Space Sweeper with Sling-Sat, or 4S for short, would harness the momentum imparted by capturing and ejecting one object to slingshot on to the next chunk of space junk, its developers say. “The goal of this mission is to remove as many pieces of debris with the minimum amount of fuel,” said Daniele Mortari of Texas A&M University. NASA estimates that about 500,000 pieces bigger than a marble and 22,000 as large as a softball whiz around Earth at fantastic speeds. And there are probably hundreds of millions of flecks at least 1 millimeter in diameter. This cloud of junk poses a threat to the satellites and spacecraft circling our planet, including the International Space Station, and many researchers say humanity must act soon to prevent the problem from really getting out of hand. Many ideas have been put forward over the years to combat the space-junk threat, including schemes that would blast debris with lasers or snare it in a giant net. 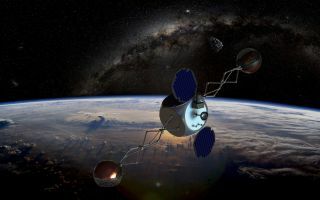 “While they are interesting to think about, they are often threatening to operating satellites, or need technological advances that are decades out,” Missel said of some of the more ambitious offerings. The most technically and politically sound idea is a simple rendezvous mission, during which a clean-up craft would travel to and de-orbit debris objects one at a time, Missel said. But such a mission would burn loads of fuel to get between widely spaced targets, making it “fatally plagued by inefficiency,” he added. The 4S system, which Missel and Mortari are developing, aims to correct this fatal flaw. It would snare debris at the end of a spinning satellite, then fling the object down to burn up in Earth's atmosphere. The spacecraft would harness the momentum exchanged during both of these actions to cruise over to the next piece of space junk on its list, minimizing fuel use and extending its operational life to the point that such a mission might be practical. Work on 4S this year includes looks at hardware options, Mortari said, and further optimization of the idea.